The “conditions” refers to several facts; among them that less than half of all crimes in México are solved. 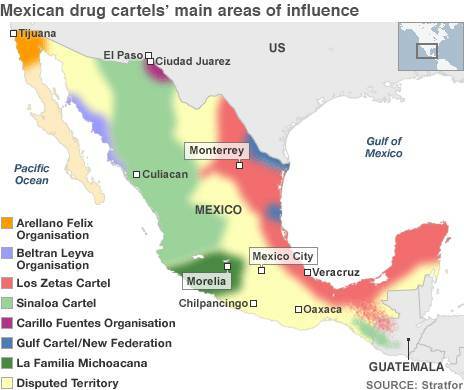 Another is that the drug cartels are winning México’s current war on the narcotics trade, which is the result of yet another condition: the Mexican government has lost almost complete control of its military and police forces. What happened to Bolivia and Colombia in the 1970’s is happening to México now – but with a lot more blood. 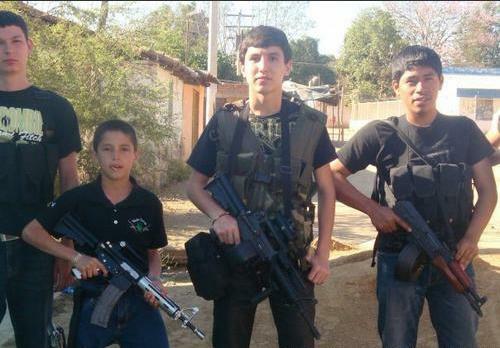 The drug cartels have forced their way into the Mexican fabric of life. They’ve intimidated people into not running for public office and not voting. They’ve forced entire police forces to abandon their posts. Now, they’re compelling newspapers and magazines to stop talking about them. Someone should have seen this coming. When newly-elected Mexican President Felipe Calderon formally launched the nation’s war on drugs in December 2006, many American politicians collectively said, ‘It’s about time.’ Many drug policy experts, however, merely shook their heads. I don’t think any of them really knew what horror would be unleashed upon the Mexican populace. Thus far, in the past five years, the “war” has claimed nearly 48,000 lives. The U.S. casualty rate from the Vietnam War stands at just over 58,100 – not including those listed as missing-in-action – in more than a decade of involvement. The incessant violence has prompted the U.S. State Department to heighten its alerts. Mexican tourism has experienced a predictable drop in visiting Americans. Religious missionaries are starting to forsake the poor and downtrodden in México for the safety of their own staff. But, there’s yet another condition people often don’t admit: Americans are the biggest consumers of illegal narcotics. As of 2011, an estimated 22 million U.S. residents age 12 and older – almost 9% of the population – use illegal drugs. In contrast, roughly 5% of México’s population consumes illegal drugs; a fact that Mexicans are quick to point out. The drugs are flowing north from Latin America into the U.S. and staying here. They’re not being shipped further north into Canada, or out to Europe and Asia. The U.S. isn’t a staging ground for the shipment of narcotics; México is. And, Americans are happy to buy. They always have been, in part because they’ve always had the extra cash. That’s one reason why I never felt sorry for Robert Downey, Jr., as he battled his proverbial demons, and never shed any tears for Whitney Houston when she overdosed and died back in February. People like that are responsible for America’s drug pandemic and – vicariously – the horrific bloodshed along the U.S. – México border. If they didn’t have the appetite for cocaine, methamphetamine, marijuana, or whatever they take, and the money to buy it, we wouldn’t be in this mess. It’s really as simple as that. The solutions, however, are not so simple. The U.S. has to revamp its entire drug policy. México has to rebuild its political and law enforcement structures. They each have to realize the problems lie with both countries and stop pointing their fingers at one another. Here’s proof how ingrained narcotics have become in American culture. Late on the afternoon of July 24, a Dallas police officer fatally shot an unarmed man in a residential area of the city’s far southeastern corner. It didn’t help that the policeman is White, and the victim was Black. The dead man, James Harper, had previous convictions for drug dealing and had run from a house that police knew was a place where drugs were sold. Police had responded to a fake 911 call claiming “four Latin males armed with weapons” had forced a Black man into the house with his hands tied behind his back. When officers tried to enter the house, Harper and three other men bolted from it. One man was caught and immediately surrendered. But, Harper ended up in a physical confrontation with one of the policemen whom he kicked in the chest. The officer managed to remove his weapon and shoot Harper to death. Almost immediately chaos erupted on the streets, as scores of residents poured out of their homes. More police arrived, as did the media. But, the pastor of a local church also showed up and dived into the agitated crowd. His presence, perhaps, helped to quell the anger on that hot Tuesday afternoon. As the ruckus subsided, one woman asked the city of Dallas to pray for that neighborhood. “There’s a demon here!” she screamed through tear-stained eyes. why residents are angrier about the death of a convicted drug dealer than the fact that drugs were being sold in their neighborhood. This is the crux of the problem. Just as drug cartels seemingly have infiltrated México’s political and law enforcement systems, some communities in the U.S. have let drug dealers operate with impunity. It’s easy for me to sit in the comfort of my suburban Dallas home and declare that México’s newspapers shouldn’t let themselves be intimidated into silence. But, that’s just the writer in me. A number of journalists have been murdered in México in recent years, as they covered the ongoing drug war and linked the violence to government and police officials. Therefore, I understand why El Mañana newspaper has made that difficult decision. But, if someone doesn’t speak up for the victims of the failed Mexican and U.S. drug wars, who will? Silence about these matters just isn’t an option.